Cholula doesn't seem to want us to leave. Which is fine, because it's a nice enough spot that we're at and there is still stuff for the group to do in the area. Or for others, it simply gives you a chance to relax and get caught up on things. Which is pretty much what we did yesterday! I spent the morning inside on the computer getting caught up on our expenses from last year. I got behind because we had bought a lot of stuff on Amazon at the end of November and had never got around to figuring out how much everything was in Canadian dollars and putting it into my computer program. With that done, I did some research into our onward travels. 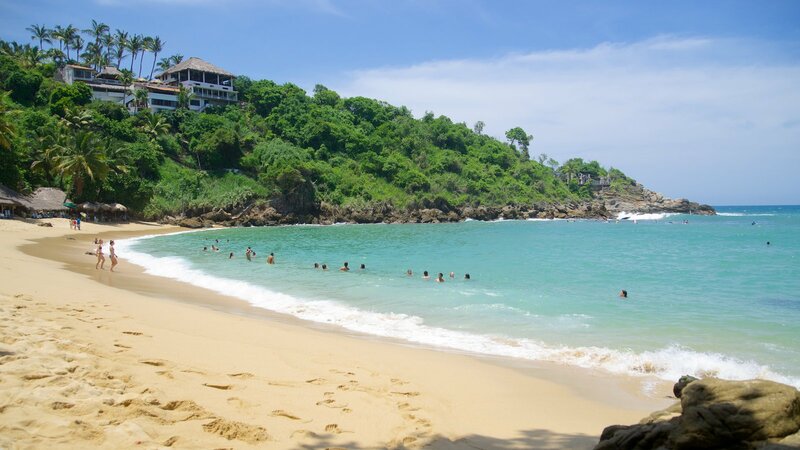 One of the places that was going to be difficult with a group of eight rigs was Puerto Escondido. There are no actual RV parks in Puerto Escondido, however there are a couple of places where smaller class B rigs would fit. And we have parked Sherman at our friends who live in nearby Barra de Colotopec, but they would only have room for two or three rigs at most. I was starting to think that we would have to divide our group up for that stop. Ruth had mentioned a big parking area at Puerto Escondido's beautiful Playa Carrizalillo, and I started looking into that. It's a public parking area for the beach, and there is a hostel located right there. I contacted the hostel, and they seemed to think it would be fine. We could park in the public parking and use the services (bathrooms, lounge, internet, pool) of the hostel. The girl was going to check with her boss, but she thought it would work! We would only be a short walk to this beautiful beach. Hopefully it will come together. After lunch, I got up on the roof and cleaned Sherman's solar panels. We are not plugged in here at this park. The only reasons we would ever plug in anyhow is to run our fridge on electric and to run our electric heater in the morning. Both, only to save on propane. Otherwise, we are quite happy not being plugged in. We learned during our first year in Mexico that it is better to be self sufficient for electricity. Many RV parks in Mexico do not have good electrical infrastructure, and the wiring is very poor. Mexico voltage is typically higher than in the U.S. or Canada, and we often see it around 128 volts, which is fine, but we have also seen it as high as 135 volts, which for RV electronics is not fine. And, we have seen it start off at 128 volts, but when two or three rigs plug in, it drops to 95 volts... which is also not fine! We just find it easier most times to not plug in at all. While up there, I noticed that the other rigs solar panels are pretty dirty as well. As the youngest guy here, I offered to get up and clean them all today. After Oaxaca, we have an extended period of dry camping coming up. Likely until we get to Acapulco in early February. Then, I gave Sherman's passenger side a sponge bath. I'll do the other side today. Having not had any exercise yet, I suggested to Ruth we do a power walk into town and use an ATM. We did the 4.5 km (2.8 mile) return trip in 52 minutes, but that included stopping at three different banks. The Santander has a reasonable fee, at 34 pesos. But there was a huge lineup, so we went down the road to the Scotiabank. They wanted 100 pesos, which is the highest I have ever seen. Nope, cancelled that transaction! Then to the Banamex where it turned out to be only 30 pesos. You really have to shop around. Up until this year HSBC used to be reasonable, but their fee is up over 60 pesos now as well. Stopped to take a photo along the way. 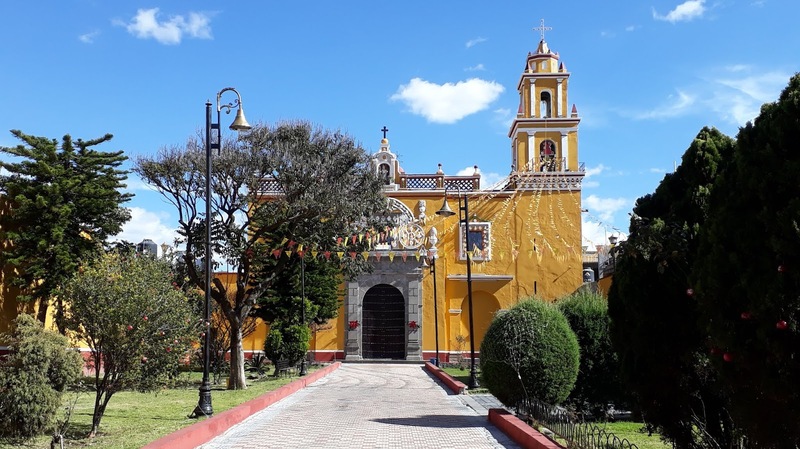 Cholula has lots of churches! Interesting sky, but the volcano was quiet. So, we are taking one more day here while Roy and Sue recover. Hopefully they will be well enough to travel on Thursday. Great deal on an ice maker! Use coupon code 4H3HA7SS for a 38% discount! Two year warranty! Wow. That’s a beautiful mural and another beautiful sunset! 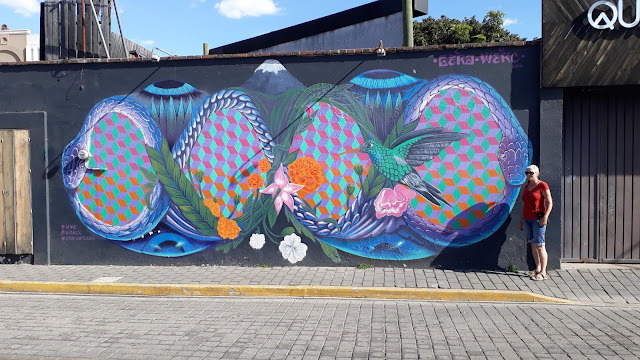 I love the colours in the mural, they are so rich looking. As always great blog and photos. Solar is great. One less thing to do upon arrival. The less to hookup the better. With everything onboard, you stop and pop a cold one. The lot is flat and very expansive. Weekend buses tend to park here. The beach is right there 182 steps down. Enjoy! Also, lots of restaurants along the Rinconada where the hostel is.